The unanimous Appeals Court ruling clears the way for Reed’s case to proceed against the Gallatin County Sheriff’s Office, Doug Lieurance, and Brian Gootkin, for violating Reed’s First and Fourth Amendment rights and related Montana constitutional rights, and for failing to train officers on Montana’s obstruction statute. Volunteers are an integral part of Buffalo Field Campaign and a cornerstone of our fieldwork. 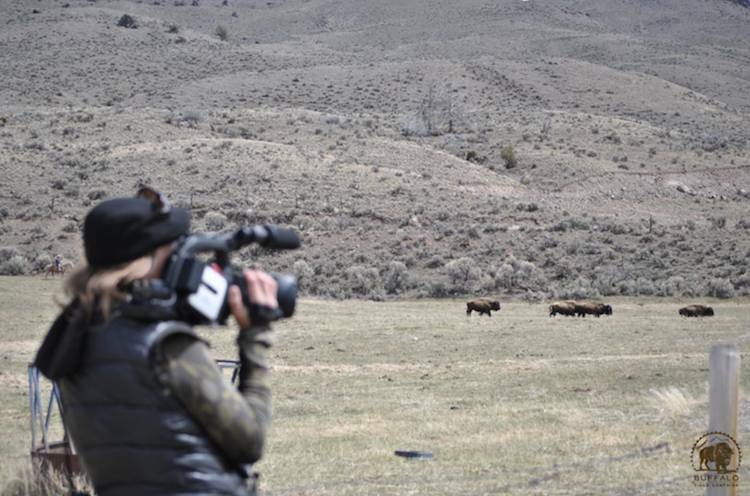 The personal experience of being on the landscape with the buffalo offers many learning opportunities. Volunteers patrol the buffalo’s habitat, learn the buffalo’s distinct migrations and behaviors, and directly experience the buffalo’s plight. Like the mother buffalo defending her newborn calf from harassment by livestock agents, sometimes you must stand your ground, turn your horns, and defend your right to be here. Recently, the 9th Circuit Court of Appeals delivered a victory for Anthony Reed, a BFC volunteer who was cited and arrested by a Gallatin County Sheriff’s Deputy during a buffalo hazing operation along the Madison River and Highway 191. (You can read the ruling here: Reed v. Lieurance et al., opinion (9th Cir. 2017, PDF). Reed’s arrest on May 23, 2012, occurred shortly after BFC volunteer evidence was used in another case brought by the Alliance for the Wild Rockies and attorney Rebecca K. Smith, who secured a federal judicial restraining order on May 14, 2012 temporarily prohibiting the Montana Department of Livestock from flying helicopters in the agency’s buffalo hazing operations. Attorney Rebecca K. Smith successfully argued for the Gallatin County prosecutor to drop the officer’s citation and the court dismissed Reed’s charges. Smith and the Public Interest Defense Center then filed Reed’s constitutional suit after years of multiple BFC volunteers being arrested and cited for attempting to witness and document Department of Livestock-led operations that harass migratory buffalo on National Forest habitat in Montana. Attorney Tim Bechtold, of Bechtold Law Firm, assisted in Reed’s trial. The 9th Circuit found Gallatin County Deputy Sheriff Doug Lieurance did not have probable cause to arrest Reed and threaten him with jail for attempting to observe a government-led hazing operation forcing buffalo and their newborn calves from National Forest lands. Abused his discretion in excluding Reed’s expert testimony on police practices and the failure-to-train officers. The Appeals Court also found Reed presented evidence sufficient for a jury to conclude Deputy Lieurance unreasonably placed restrictions on and desired to chill Reed’s constitutionally protected activity, and future activity, and the Deputy’s threat to take Reed to jail was retaliatory. While the Appeal’s Court ruling vindicated Reed’s constitutional rights, he will have to seek a new trial to be decided by a fair and impartial jury before a new judge. Buffalo Field Campaign applauds and give thanks to the Public Interest Defense Center and attorney Rebecca K. Smith for her extraordinary legal advocacy in securing a 9th Circuit ruling upholding people’s constitutional rights, attorney Tim Bechtold, Bechtold Law Firm, for assisting at trial, and to Anthony Reed for standing his ground, turning his horns, and defending the constitutional rights we hold in common.